Could you start by telling me who lived down on Brown Mountain Creek? The first place going down the creek was a grist mill owned by Ed Davis. Taft, could you tell me what the grist mill was? It was for grinding corn mostly to make cornmeal. It had a gas engine. It started on gas then switched over to kerosene. The mill was there before 1920. We took our corn there. Before Davis put his mill there, we had to go over to Oronoco. Pet Tomlin had a grist mill over there. Joe Davis put this one in on Brown Mountain Creek and sold it to his brother Ed Davis later on. It wasn't too much of an operation. It had one of those hit and miss engines with the big fly wheels, you know. About eight horsepower I guess. It used stones to grind the corn. The mill owner would take one eighth of the corn for payment. There is eight gallons of corn in a bushel. He would take one gallon for grinding and give you seven meal. He would sell his or use it for his own use, for his cattle or whatever. He would sell meal too. You could go there and buy meal. The people in the community here around were the ones who would buy it. As you go down the Appalachian Trail (AT) and hit the creek (Brown Mountain Creek), where would the grist mill have been? It would be up the left prong. There were three families above that point. Wilbur Higginbotham was the second one going down, and then Pony Davis had a place before you get down to the trail. So starting from Route 60 where the creek crosses, there was Ed Davis's grist mill, then Wilber Higginbotham, and then Pony Davis's before you hit the AT? What did Higginbotham and Pony Davis do? They farmed when they were there. That is all they had to do. They were sharecroppers. Now the Davises, probably they owned their land. Where the trail first meets the creek, just a little ways down on the right, across the creek there are two old chimneys. Do you remember that place? The people I knew who lived there was Camden Sandridge. His widow is still living in Buena Vista, but it is his second wife. She never lived down on the creek. After he moved from down there, he moved up here on the mountain somewhere and then he went to Buena Vista and went to work for the City of Buena Vista. He farmed there too. That was a big house there. I remember the house. It was a log house. I can remember a corn crib and a hen house there also. Up on the mountain above there were probably some tobacco barns. Most people raised tobacco at the time. What was the next place down? The next one was Ann Rucker. We called her Grandma Ann because she was a granny at that time. She grannied me probably. We didn't have a doctor in them days. She was a midwife; she would help the women in the area deliver. She had a couple boys, Clinton and Stanley. I can't remember them much, they were kind of before my time or were leaving out at the time. She had some relations stay with her there too. Her place was log too. It was a small house. It had a stone chimney. The next place going down was Joseph Richardson. He was the owner of the land down there, and we lived on his place. He was our landlord. Do you think you could find his house? Sure. Very easy. I could find his place. The house he lived in wasn't very large. But the house down below there that his daddy built was a pretty good size house, but he never lived in it. Both were log houses. 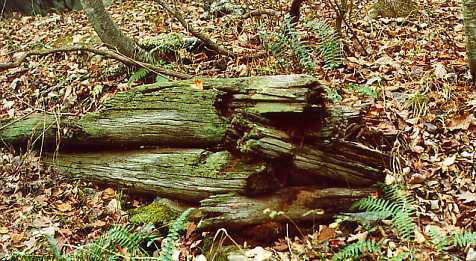 I think some of the logs are still there. How much land did Richardson own? There was 700 and some acres the two brothers owned. They sold that land in 1918 or 1920 to the government. His brother was named James. But he didn't live down there. He owned the piece of land that you all traded to me. Who lived below the Richardsons? The next place going down from where Joseph lived, up on the hill, -- the last person I know that lived there was George Ramsey; he run a sawmill there. But that was off of the road a little bit. The next place from there going down was the old Mose Richardson place. That was a log house that I'm pretty sure there is some old logs left at. It was just before you get down to where we lived. What did Mose Richardson do? Well, Mose was Joseph's dad. Mose run the mill down on Pedlar. His father was a slaveholder and Mose Richardson was his son by a slave woman. Back in them days they had a way of taking an acreage of land, so he let his son (Mose) by this slave woman run the mill so he made a little money. So that's the reason he came by the land on Brown Mountain Creek. Mose had three children: James, Joseph, and Clara. I don't remember Mose. I remember the boys, but I don't remember him. I remember the house well though. It was on the east side of the creek. My brother Fletcher lived there; he rented the house. The first people I knew lived there was John Tower. He lived there before my brother Fletcher did. They farmed. John Tower did right much carpentry work around. The next house down was where we lived. That's where I was born at. It was a log house. It had a shed kitchen on to it, made out of boards, strips up and down. It had very small windows. Do you know when your house was built? Couldn't tell you at all. What kind of floor did it have? Could you describe your family? Well, there were ten of us in the family. My mother and dad and eight children. My oldest brother was named Lawrence. Then there was Fletcher, then William, Russell, Harry, Henry, and myself. I had two sisters, one died and was buried on Brown Mountain Creek. My other sister, still living, she is in Philadelphia now, Ruth. She is 86 years old. Bessie was the one that died. I just can remember her. I was real small when she died. I understand she was about 20 or 21 when she died. I don't have no idea why she died. When was the last time you saw her grave? We went to her grave about 60 years ago. It had a stone there. There used to be a man around here that would fix up a slate stone. He put a Sunday school card in it and put a piece of glass over it. The last time I was there, the glass was still in it but the Sunday school card had disappeared. Do you remember where the grave is? It's not in the bottom. It's up on the hill, way below where we lived at. Cross the creek, on the west side of the creek. I expect it's a hundred yards up to the grave yard. Where she was buried was a regular cemetery there. It was a community cemetery. Some of the Winstons was buried there. Was there a church there in the valley? There was the old Piney Hill Church on the road going to Allwood. Back to your house and family. What do you remember about living there? There wasn't nobody around us much. We just mostly stayed home. We would go out and find a persimmon tree and get persimmons or apples or shake a chestnut tree. That's what we looked forward to most, picking up chestnuts and grapes and what have you. What did your older brothers do? My brother Lawrence, I can't remember him being home with us. He was gone away, but he would come to visit. My brother Fletcher, I can remember when he went to work down at the dam and different places for Mr. Davis at Pedlar Lake. Then I reckon around 1916 or 1917 or somewhere about there they went to Philadelphia and went to work for the City of Philadelphia. Do you know what they did down at the lake? Well, there was always something to do down there. The pipe was lined with wood and it had a lot of leaks. They would clean out the brush that came down into the reservoir. There was a lot more brush and trash then -- more so than today because of the people farming and trees going down in there. The others farmed. We helped my dad to farm. We raised tobacco, corn, oats and wheat. We made all of our flour. There was a flour mill at Pedlar Mill. I can remember when that one was running. Then Shepard had one out here this side of Pleasant View. How would you harvest the wheat? With a cradle. I have one out here in the barn. I was too small to use it then. I can remember we would put about twelve bundles to a shock, then they would take a bundle and break it, you know, and put it over top of it to keep the water off. I used to help them get the wheat to the shock and the others would stack it. They wouldn't trust me to do it. I would set it up there and it would fall down as fast as I put it up. My dad did most of the shocking. We put the wheat to him and he would shock it. Would you all thresh it? No, we had a threshing machine. In the fall, when we got the wheat together and stacked. The Burks down here had the machine, and they would come up and thresh it for you. You had to give them a toll. I don't know how much it was. I don't know how much the flour mill got either. Everything worked in toll. There was no money. Do you remember ever having any money as a child? The first money I ever earned was Ranger Wilson hired us to plant walnuts on Brown Mountain Creek [Thomas A. Wilson was the second district ranger on the Pedlar district, 1917-1927]. I believe it was the fall of 1919 or 1920. It was after the government bought it. They planted it in walnuts, planted a lot of walnuts down there. The walnuts were already hulled. They got the walnuts from Houston Staton; they come from out on this mountain here. We would put the walnuts in an old army pouch. Me and my brother Henry, he hired us two, and my dad and my older brother Russell. They would take a sharp stick and make a hole in the ground, and we would put the walnut in the hole and cover it with our foot. Do you know it they ever came up? It didn't seem like they did too well. I think I can show you some of them. Do you remember anything else about Ranger Wilson? He had two Airedale dogs. They rode in the buggy with him. If he rode his horse, they walked behind him. He took care of this whole forest here, him and them dogs. He was a fine man. He would stop by to visit. My dad liked to talk, but he wouldn't take up too much time. Do you remember how much money you made planting walnuts? Two dollars a day. That was good. That was big money!! We probably worked a week maybe. I was nine years old. My mother got it. It helped out the household. What kind of cook stove did you all have there? Momma had an iron stove, cook stove. It wasn't large. In the wintertime, she cooked a lot by the fireplace in the living room. She would cook ash cakes. She would make it in pones, kind of like a terrapin. You know what a box turtle is, don't you? We called them a terrapin. Well, the cake would be shaped like that. She used cornmeal for the ash cakes. She would make light bread by the fire too. She had a skillet with a top on it. She made her own yeast; she would take potatoes and make a yeast. She'd rake out some coals and set that skillet out where there wasn't much fire until the bread would rise. After she got it rose like she wanted it, she would put the fire over top of it, and we would have light bread. She would put about three loaves in the skillet at one time. There was a hook up in the fireplace across, and she would hang a pot up there and boil the beans. Could you describe the ash cakes? She would sweep the hearth off, and then she would put the cakes on the rocks. She formed them with her hands. She would put ashes over them first, then she would put hot coals over them. I don't know how long it took to cook them. We was always hungry and couldn't wait to get them. No indeed. She would take them out of there, and she had a special broom made from corn, broom corn. She'd sweep them off real good, and then she would wash them. You didn't taste any ashes on them. But they were much sweeter than if you baked them in a stove, much sweeter. We'd eat them right there, and lots of times for supper we'd have that and a glass of milk. I wished I had one now; I could eat that even though I've eaten my supper. It would be impossible to match that flavor. What would your mother cook on an every day basis? For breakfast, we always had flour bread, we called it. That could be light bread, or it could be hoecakes. My mother didn't make any biscuits much. There were quite a few of us to eat so she made bread in pretty good size hunks. Then she would break it up. We would have sorghum molasses, was most of our sweet. My mother would make quite a bit of preserves from time to time, but we would want the sorghum molasses more so than we did the preserves, and I still do. We would have eggs for breakfast from time to time, bacon. My dad always smoke his meat; hanged it up. We had right many chickens. My mother raised lots of them. Do you remember how large your house was? The big part of the house was about 20 x 24 maybe, but we had an upstairs, and there was two rooms to it. All the brothers slept in the same room, and my sister slept in the smaller part. We had beds. They weren't homemade beds; they were beds, but what we had for mattresses were straw ticks. My mother and dad, they had straw, and then they had a feather tick on top, but we didn't have that feather tick. We would be so glad when they first filled the tick up. The bed would be up high for a little while, but then you would be down next to the slats. It would settle. Between the house and the creek, there was a little apple orchard. At the back of the house it was real steep. We couldn't have a garden or anything there, on the east side. We had a tobacco barn there and an old stable where we kept the horses in. All that was logs, chestnut. That's right. My dad paid a fourth of the crop. If you owned your team, you only paid a fourth, but if you didn't own your team and the landlord had to furnish the team, you had to give half of what you made. My dad always had as much as two horses, and sometimes three horses. Sometimes he would raise a horse. We had an old road wagon. Do you remember going out of the valley on trips or visits? As far as ever I went with them in the wagon was -- people used to have sassafras oil mills back then -- I come with them to John Whitmore's sassafras oil mill. That must have been in 1915 or 1916. Yes, it was. The world war was going on then. I never went to Buena Vista until I moved up here. My brother took me over to Buena Vista in a wagon. He had some apples to peddle. Can you remember that trip? Oh, Lord, yes. I was eleven years old at that time, 1922. You came down Long Hollow. That was farmland then. There were only three or four houses until you got down to the culvert (railroad trestle). There were two ways of getting to Buena Vista. There was a way like coming up Route 60, and if we were walking to Buena, that's the way we would walk. If you had a wagon, you would go over the Jordan Road. Could you tell me about your parents? My granddad came from Rockbridge County. He said he was a Douglas over there. I don't know why he changed his name. My granddad told me that one of these Richardsons married a Douglas girl in Rockbridge. My granddad was a young man, and he drove the carriage and worked around the house mostly. My granddad was a slave. When the Richardson boy was to take his wife over here to Amherst to live, this girl's daddy asked the girl what did she want for a wedding present. She said she wanted Billy. That was my granddad. He said that when he was coming on across the Blue Ridge, he said, "Well, I ain't going to be a Douglas when I get over there. I'm going to change my name to Hughes." So that's the reason we come by the name of Hughes, but, actually, we are Douglases. Back in them times the slaves went by the slaveholder's name. Like my mother, the Hiltons owned her, here in Amherst, and she went by the name of Lucy Hilton. Who did your grandfather marry? My grandfather married old Marsa's daughter by a slave woman, Richardson's. She was a slave woman. They lived down near where Brown Mountain Creek empties into the Pedlar River. Those Richardsons were some relations to Mose. Do you remember how many children your grandparents had? There were a right many of them, but I couldn't tell you all of them. I remember quite a few of them though - Jim, Sam, Willis, Bob. Where did your grandparents live? As you are coming up to Panther Falls, about a half a mile up from the bridge where the people camp there. They had a little small cabin. The whole thing wasn't much bigger than this kitchen here. The two old people lived there their last days. Do you know how they were supported? Well, back in them days, if you didn't work and make something, you didn't eat nothing. That was a known thing. There wasn't no such thing as welfare or meals-on-wheels or anyone to give you food stamps or pay your light bill. If you didn't work, you didn't eat. Them old people worked. My dad worked right up until he died and made his living. Do you remember any stories that your grandparents told about being slaves? There was a story about Jess Richardson. What happened was -- now my granddaddy told my mother and dad this because this was before their time -- Jess Richardson had a bunch of slaves up here on Brown Mountain Creek. He owned that land there on the creek. I reckon that one of these slaves did something that he didn't like, and he almost beat him to death. They said that Richardson was real old, just tottering along, but he could ride a horse. After he beat the slave, he got on his horse and went on down Brown Mountain Creek and went by a rock (I think I still know where the rock is), and something jumped off that rock and grabbed him around the waist, and they tell me the horse started running and went on down and crossed the road and went on home. The next morning, they said that he was dead and the horse was too. Now that's what they told. They called the rock after that "Scare Rock." But I don't ever remember seeing anything down there or hearing of anything happening. You said that your mother and father were born slaves. That's right. My mother was born the 17th of March, 1865. My dad was born the 22nd of March, 1865. Lee didn't surrender until April. One thing I do remember; I heard my mother say that her mother told her (they always called them Marsa or Mistriss, the slaveholders,) the Mistriss said that "if I would have knowed you niggers were going to be free this quick, I wouldn't have paid your granny fee." I think it was about 75 cents or a dollar. That slaveholder didn't sound like a nice person. Well, I don't say that he wasn't. They had to have a way back in them days, just like people have today. People who had control of things, they would have to use it in a way of "I am the boss," you understand. I remember my mother and father telling me another story about Jim Richardson. He was a slaveholder. My mother and father had two children at the time. She said after she had lunch, she fixed a lunch up and sent it up by my dad to Jim Richardson. He lived down near the Pedlar. He said that he was sitting on the steps grating corn. They would take a piece of tin or stovepipe and punch holes in it then turn it over and nail it on a board. Then they would take the dried corn on the cob and grate it off so they could take it to the mill. My dad said that when he got there with the lunch, he was sitting there grating him some corn. My dad said that here was some lunch that Lucy sent you. He said that he dropped his head and commenced crying. Tears run down in his corn. He just laid his grater aside. Why do you think he was crying? I reckon it was his conscience. He had been their marsa. They was his slaves, and here they was doing that for him. You couldn't hold it against them because back in them days the black people owned slaves too. They bought and sold slaves too, until I believe, 1831. It ain't no difference in people slaving you, what race they are. They brought white people here and slaved them too. Do you remember making music or singing or entertainment down on Brown Mountain Creek? No I don't. None of my people made music. My dad and mother either one didn't believe in going to dances. My mother could read, and she read the Bible to us a lot. My dad couldn't read. Do you know how long your parents lived there on the creek? Quite a while. I expect they were there 20 or 30 years. They didn't start housekeeping there. My dad used to run the mill for Dr. Berry, and he lived on Dr. Berry's place before he moved there. That was above the lake on the east side. Was Dr. Berry a medical doctor? He took it up himself. They said he was a real good doctor, but he took it up himself. Do you remember your moving from the creek up here to the mountain? The year we left from down there my brother Russell had got married, and he lived in the old house there (on the creek) for a year after we moved up here. We could have stayed that year. They had worked out something with the government that my dad could have stayed that year, but they would have to have left after that year. We moved because the government bought the land. Do you remember people coming by and talking or visiting when you lived on the creek? Yes, quite a few people would come by. There was a fellow, Tom Lipskin, who lived up above Panther Falls, on the old Brown place. He was a farmer. He would come in the wintertime as much as two or three times a week. He was a great Bible reader. He knew the scriptures, and he was in politics a lot. Him and my dad would talk about politics. I'll never forget him. He was sitting there one night reading the Bible. We had an old cat named Tom. Now, Tom Lipskin was right bad about cursing. Well, the old cat was up on the mantelpiece over the fireplace, and I reckon the cat fell asleep and fell down on Mr. Lipskin, and he just cussed the old cat and smacked him off and kept on reading the Bible. Do you remember what they talked politics about? He was a socialist. He belonged to the Socialist Party. My dad voted Republican. I am too in a way of speaking. He would usually come in the evening. He liked to eat, and my mother would cook for him, and he would have supper. He would stay until about eleven o'clock and then walk on over the hill, over Brown Mountain. It was a right good little jump over there. Can you remember Christmastime on the creek? Yes, Christmastime was a big time. Sometimes we would get an orange, most of the time we would get one orange. Back in them days they had dried figs, some candy. Ole Santa Claus bit off my cheese one time when he was putting it in the sock, and I wondered why he had to bite off the piece of cheese that he cut off for me. We would get grapes once in a while, and raisins. We wouldn't get toys, didn't have any toys at all. You didn't hear anything about toys in them days much. Did your sister get dolls? Yes, my sister Ruth would get dolls. My sister-in-law, who lived away, would send her dolls. My brother in Philadelphia would sometimes send us a box from there, and it would have different things we didn't have. Would your brother come back to visit? Yes, and my uncle, George Hilton, from Pittsburgh would come home every August and stay a month. He was single, never married. They were special times. That was the same as ole Santa Claus coming when they came home. They would bring us things from there and talk about what was going on. I thought if I could get big enough, old enough to go to Philadelphia, I'd be tickled to death. I made my first trip there in 1927. When I landed up there, I would have given anything to be back down here. I stayed up there part of seven years. I didn't like it up there and still don't. Describe how you all got here to this place. The family took the wagon around the road. I come up Gillidge's Branch here. My job was to bring up an old cat that had belonged to my sister that was dead -- an old cat named Charlie. I brought him up in a bag. I was eleven years old. I got up here before the others did. The Ogdens had moved away from the house. They owned this place and had moved to Buena Vista. There was an old rail fence there. My brother Fletcher in Philadelphia had bought the place, but my dad helped to pay for it. It cost two thousand dollars. When I got here, I seen all these corduroy pants hanging on the fence. I ran up to get me a pair since I was the first one there. A bird had built a nest under where the pants hung over the fence, a wren. The pants were so dirty that I couldn't do anything with them. The Ogdens had just left them there. They looked new to me. I never had had any corduroy pants. What kind of clothes did you have? My mother made my shirts. She would get striped cotton for the winter and thinner stuff for the summers. We didn't have much for shoes. We had one pair of shoes, and they had to last you a year or better. They were store bought. Do you remember ever going to a store when you lived on the creek? No, I don't ever remember going to a store when I lived on the creek. Another question I had about the house on the creek: Do you remember where you got your water? Near the creek a little above the house there was a spring, but sometimes that spring would go dry. There was a good spring at the next place up, and sometimes we would have to go up there and carry water when ours went dry. When we were going down the creek naming families, we stopped at your house. Were there more families that lived below you? Daniel Winston was the next one below us. He had one son named Mose and one Joe and Maude and Minnie. They farmed. Do you remember playing with other kids down there on the creek? No, not much. There weren't any there to play with. I had playmates when I got up here. What would the family do on an average night after supper? We would sit down and talk. My mother would read the Bible. She would read the paper to us. She would go to the post office once a week and get one. There was a post office on the Brown place on the Pedlar. There was another one where the Brown Mountain Creek empties into the Pedlar. It was called Way. There was one at Oronoco too. She would read the paper to us. We would have old catalogs to look at. There was a company named Charles Williams Mail-order. Bell Hell, Montgomery Ward and Sears Roebuck. My mother did right much ordering if she could get some money. My uncle in Pittsburgh would send her money. Tell me about harvesting and curing tobacco. First you cut it, and you laid it down until it withered. Then we would put it on a slide and take it to the tobacco house. Then we would fire it to dry it out, take it down and strip it, tie it in bundles and take it to Lynchburg. I didn't like to work in tobacco. Did you ever smoke or use tobacco? Yes, I used to smoke a corncob pipe. I smoked for about 30 years and chewed homespun tobacco. I started to use tobacco when I was nine years old. Did you smoke in front of your parents? No, we didn't smoke in front of them. We would go hide. Did your mother use tobacco? I remember my mother would have a toothache, and she would smoke a pipe a little bit for the pain. She used it just for that. Do you remember your grandmother Hughes' first name? Harriet. My mother was Lucy, and my father was Elie, but they called him Putt. But his name was Elie Abner Hughes. Would your dad haul the tobacco to Lynchburg? Not usually. He would hire someone to take it, but he would go along with it. It would take a week. Roads were bad and muddy. He had to pay a fourth of the tobacco. He would owe the Knights in Buena Vista some money, and probably he would owe some merchants around some more. He was going to pay you if he only had one dime. He always told me, "don't never go in debt." He hated to owe anybody. Tobacco was the big cash crop. The corn we turned back into food for the family. We had a cow for milk. They didn't want the sharecropper to have too much because the landlord wanted to stay ahead, you know. siblings to Long Mountain. 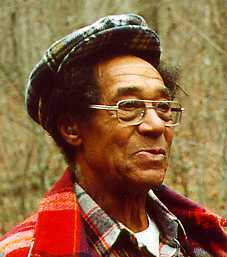 In 1936 he married Dora Black, and they built their home on Long Mountain where they have lived until his death. 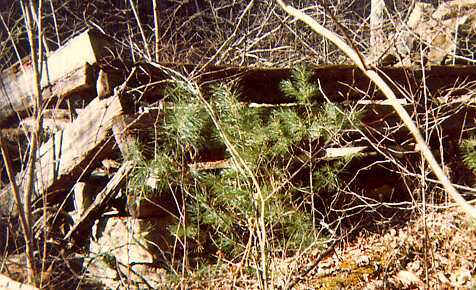 On Saturday, November 7, 1992, the NBATC conducted a hike titled "Old Homesteads on Brown Mtn. Creek." 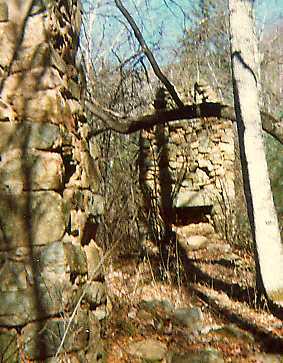 The hike was led by Dave Benavitch and included Taft Hughes who pointed out many of the sites described in the oral interview. The pictures displayed on this page were taken by Sandra Elder during that hike.